IDC's public interpretation of its smartphone market figures were outlined in a press release that focused on market share, particularly noting that devices using Android now account for 81 percent of its total figures. IDC also emphasized the percentage of growth in Microsoft's Windows Phone platform "which grew an amazing 156.0% year over year," the research firm stated. Windows Phone grew to 9.5 million shipments compared to 3.7 million in the year ago quarter, an increase of 5.8 million new shipments. In contrast, Apple's iOS "saw its market share decline during 3Q13," IDC stated, outlining YoY sales growth of only 25.6 percent. However, based on IDC's numbers, Apple's sales grew from 26.9 million to 33.8 million, an increase of 6.9 million new sales. Similarly, among Android licensees IDC reports YoY growth of "only" 51.3 percent, but that represents shipments of 71.7 million more devices than last year, more than ten times the number of new Phones sold. The problem for Android is that its high volume sales are not generating profits, because the majority of those volumes represent very low end phones. We can easily deduce this by subtracting Apple's known revenue. Apple's iPhone ASP for the quarter was $635, down from the company's year ago figures of $675. The company reported selling 33.8 million iPhones, resulting in about $21.5 billion in gross revenues. IDC reported that overall "smartphone average selling prices (ASPs) have continued to decline as the appetite for more affordable devices grows. ASPs were down -12.5% in 3Q13, accounting for an average price of $317." At $317 each, IDC's estimate of 261.1 million smartphones results in nearly $82.8 billion in total revenues. 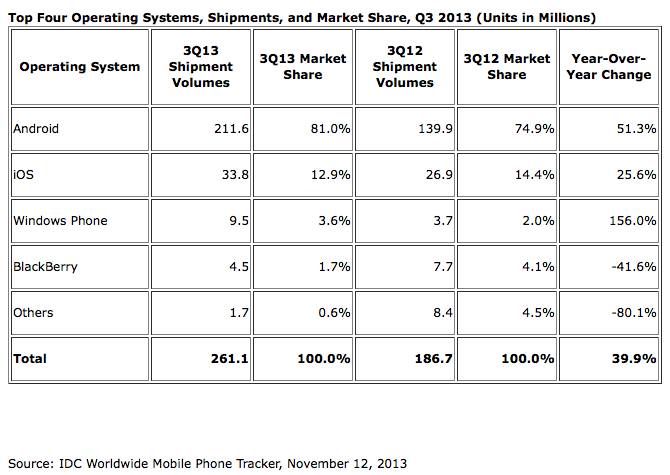 However, these numbers include Apple's much higher iPhone ASP. Subtract Apple's $21.5 billion and you're left with $61.3 billion. Across the remaining, 227.3 million non-iPhone devices, that leaves an ASP of less than $270. However, most of the "smartphones" IDC is counting sell for far less than even this. We know this because IDC also outlined an ASP specific to premium phablets. IDC defines phablets as large-screen smartphones with 5-7 inch screens and "more powerful and expensive components." The firm reported that its ASPs for phablets plunged by 22.8 percent over the year ago quarter, and is now sitting at $443. In contrast, despite much handwringing about Apple's falling ASPs, the iPhone has only seen its ASP figures fall by 5.9 percent year over year. Market share growth achieved by slashing ASPs and margins is something that analysts both recommend and gravely warn about, but Apple isn't following the rest of the industry in doing that. IDC's 21 percent figure for phablets is remarkably high; previous numbers for big screen phones have been closer to 10 percent of the overall market, but as Reith noted, this is a new peak because just a year ago, the proportion of big screen phones was at just 3 percent. That means phablets accounted for a whopping 54.8 million of the total number of Q3 smartphone shipments, 1.6 times as many phones as Apple sold in the quarter. Multiplied by IDC's $443 ASP, these phablets account for $24.3 billion in total revenue. That's more than Apple's total revenue, but there's far less profit there because the ASP per premium device is whopping $192 less. Add IDC's premium phablets to Apple's iPhone revenue number and subtract both from the total smartphone revenues IDC is outlining, and you get $37 billion remaining. However, there are vast shipment volumes remaining too: 172.5 million "smartphones," accounting for 66 percent of all the total volumes IDC counted. Divide those remains and you get an ASP of $214.50. Other segments of the overall smartphone market involve devices with higher ASPs: IDC says Blackberry devices are currently selling for $386 and Windows Phone ASPs are $287. Combined with "other," however, these devices account for less than 6 percent of the entire market. As IDC emphasizes, the "smartphone market" is 81 percent Android, so most of the incredibly cheap devices that are pushing ASPs toward $200 are super cheap Android phones that sell for even less than this average because the total Android ASP still includes some premium Android phones that don't count among phablets: 4-5 inch devices that sell for prices similar to Apple's iPhone, such as Samsung's flagship Galaxy S4. This reinforces that about two thirds of the overall smartphone market is represented by extremely low end "mass market" devices that are really only called "smartphones" because the industry has decided that running Android makes a device "smart," even if it is a product like the Samsung Galaxy Y, with a hard to read, low resolution screen and such anemic processing power and limited memory that it can't really run apps and can't be upgraded, with hardware specs inferior to Apple's iPhone 3G from five years ago. 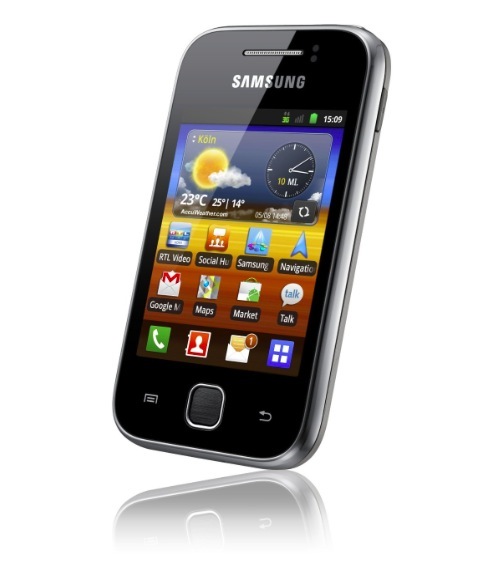 Strategy Analytics recently credited the ancient, essentially obsolete Galaxy Y as significant component of Samsung's "smartphone" shipment volumes, helping to further illustrate the worthlessness of marginalizing Apple's premium iPhone sales in a "market" that is mostly junk. 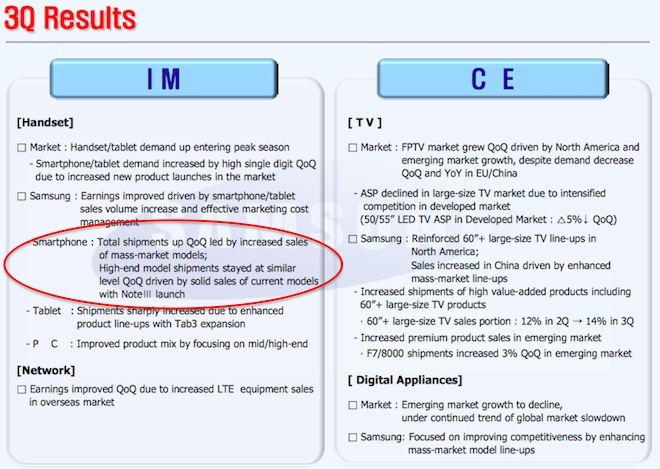 Last week, Samsung leaked a similar one third proportion of premium smartphones (its Galaxy S and Note lines) to its two thirds volume of low end devices, following up the admission that its smartphone sales growth is coming entirely from mid to low end models while its high end sales remain unchanged. While industry market research firms like IDC and Strategy Analytics consistently focus on market share and shipment volumes, it's becoming clear that smartphones are joining tablets in replicating the history of PC sales. Over the decade of the 2000s, ASPs of PCs similarly crashed alongside the emergence of netbooks and similar attempts to deliver bargain priced devices. Apple swam against that trend, instead focusing on high mobility technologies including battery performance and solid state notebook designs, accompanied by higher prices. The result in the PC market was that vendors who chased low prices delivered products that the market overwhelmingly rejected, while Apple consistently outpaced the market's growth with higher end, premium sales that drew repeat customers. This trend is happening again in smartphones and tablets, where attempts to cater to low end markets have cast a negative impression over Android as a whole, apparent in the results of customer satisfaction surveys. But the problem for Android vendors is not that they aren't charging enough for their phones. This high volume, low profit strategy might make sense if there were some platform advantage to blanketing the globe with low cost smartphones. However, Android's 81 percent sales volumes aren't resulting in a boon for app developers, because two thirds of that volume is made up of low end devices that are effectively being used as basic camera phones. Low end volume sales are also not helping Android hardware makers, most of whom are losing money. Few are even seeing market share gains. As IDC's report notes, "Samsung accounted for 39.9% of all Android shipments for the quarter, while the rest of the vendors either saw single-digit market share or, in the case of the majority of vendors, market share of less than 1%." Android's heavy representation by the low end is also failing to provide Google with a viable alternative to Apple's iOS. Despite being ostensibly a larger platform, Android doesn't sell more apps or generate more advertising revenue. Instead, Android's high market share in device shipments stands in stark contrast to Apple's overwhelming share visible in real world usage stats that indicate the vast majority of smartphone and tablet app and media sales, web browser use, ad network representation, enterprise adoption and retail shopping are occurring on iOS devices.